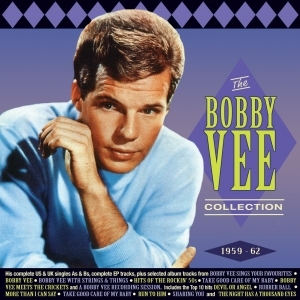 Bobby Vee was a prolific hitmaker during the immediate post rock ‘’n’ roll era, bridging the gap between rock ‘n’ roll and teen pop, with a distinctive style that brought him success on both sides of the Atlantic – he was just as popular in the UK as in his home country. He always had a close affinity with the music and style of Buddy Holly & The Crickets – he began his performing career as a 15-year-old stepping with his band to fill a show soon after Buddy’s tragic death in February 1959 at which Holly had been scheduled to perform, his debut hit with his first release had echoes of “Peggy Sue” and he later recorded with The Crickets. He recorded many memorable and outstanding hits during these crucial and action-packed early years of his career, including Top 10 entries with “Devil Or Angel”, “Rubber Ball”, “More Than I Can Say”, “How Many Tears”, “Take Good Care Of My Baby”, Run To Him”, “The Night Has A Thousand Eyes” and others. This great-value 64-track collection includes all his US and &K A & B sides, and all his EP tracks from the period, plus selected tracks from all his LP releases during this time, which did not otherwise appear on singles or Eps. As such, it’s a pretty thorough and hugely entertaining overview of what were perhaps the most significant and formative years of his career, and it’s a great showcase for his distinctive talent.